I haven’t done a Weekend Junk post since July! 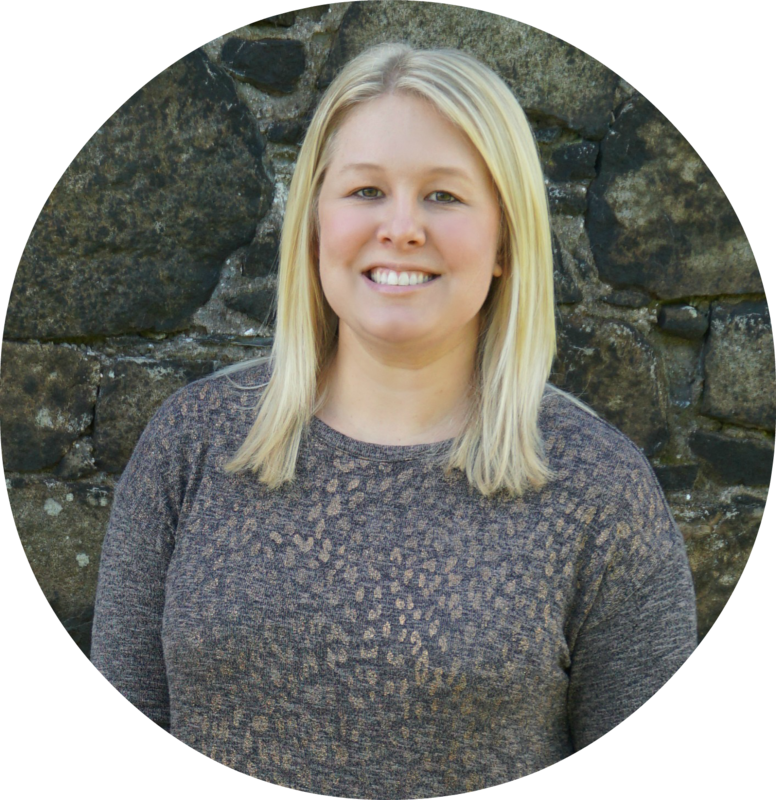 I can’t believe it’s been that long….but I’m back today to show you some of my finds from the past couple weekends. 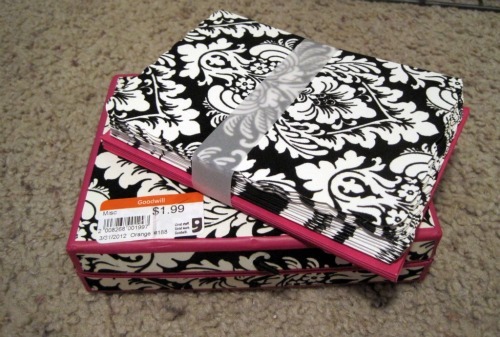 First up, I found this box of damask note cards at the Goodwill on Saturday. 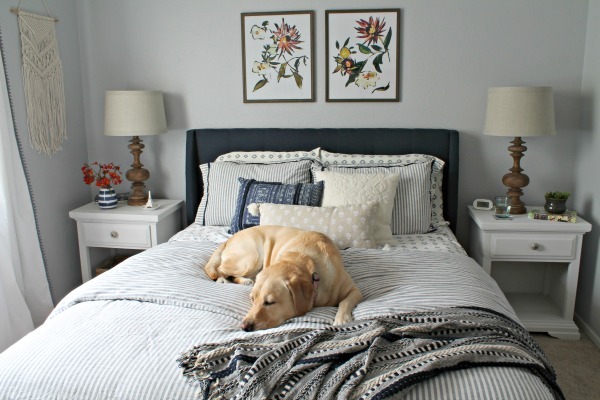 I’m like a damask hound dog…I will always sniff out anything damask! I still send hand-written thank you cards, so these will be perfect for my birthday in June. You can’t tell from the picture, but the black part feels velvet-ish. I found this cute basket organizer a couple weeks ago at Savers for $4.99. I’m probably going to paint the top white (of course) and then use it in my craft room. I could definitely use some cute storage in there! This is one of my best Kohl’s finds ever! 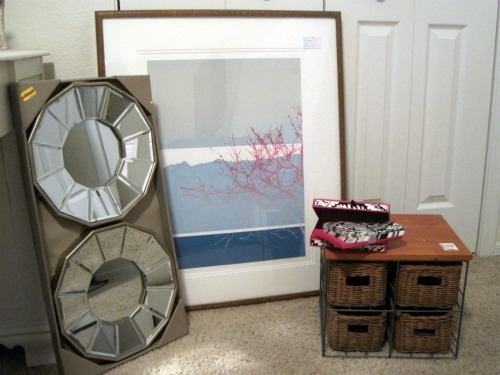 The pair of mirrors was originally $99.99, clearanced down to $19.99, and I had a 20% off coupon! 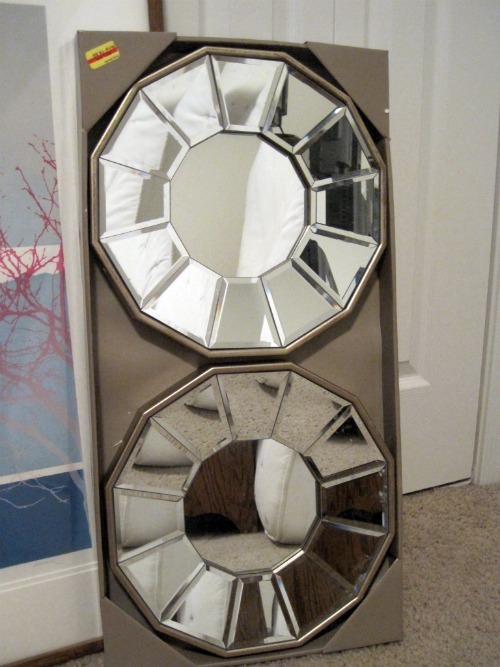 So, I got this set of mirrors for $15.99…and I had a gift card from Christmas, so $0 out of pocket! This picture is another good story. After work one day I stopped at a little thrift store and saw this picture. I loved it, but didn’t want to pay $49 for it - although it’s signed, numbered, and professionally framed, so it was definitely worth the price. Anyway, I went back to the store 3 weeks later (on a Thursday) and it was still there and was marked down to $40! And I saw a sign that everything would be half off on Saturday. So, Saturday morning I woke up bright and early and got my picture for $20! WIN! So, that’s all my junky goodness from the past few weekends. What have you found lately? Fun stuff! I love the picture - even better you got it at such a deal. Love the colors on your picture. Have you done any research on it so see who the artist is? Oh wow, the picture and those mirrors are my favorite! I have GOT to get more patience when I shop; your's really pays off!! No bargains, but I found jeans that fit and capris that fit--so that's a score (and they were both under $30 a pair). My niece works at Shoe Carnival, and I got some cute orange flats for $14 with her discount. Michael's is great, the cashier there allowed us to use all my app coupons on my purchase and then on Alice's (my niece), so that was just kindness. Love the mirrors! So retro but current at the same time...Gorgeous! 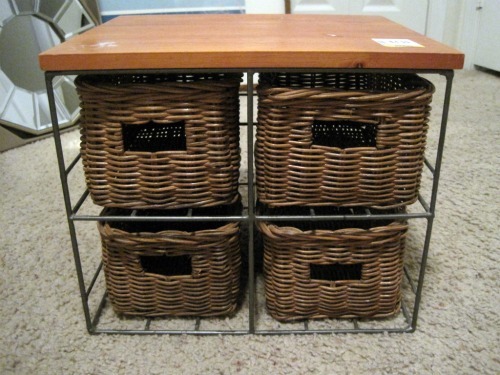 Ooooh, love that basket organizer! The picture is signed? It has a number so sound like it's part of a series. It looks like a screen print. 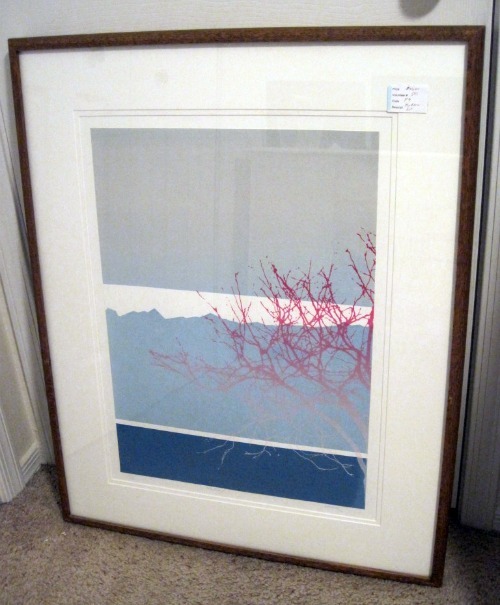 Original prints can be worth a lot of money even if the artist isn't well known. Don't do anything to it keep it somewhere it can't fade. You might have something good on your hands. Rather safe than sorry. Good advice! I'm planning to do some research on the picture...hopefully I can find out more about it. What awesome finds. I love that wire basket organizer. What great finds! Love those cards from Goodwill. This Saturday is 1/2 off everything at Goodwill so I think we're going to stop by. I always seem to find at least one great deal even though it is a mad house on that day! Great finds! love the mirrors and the art, and well, everything!